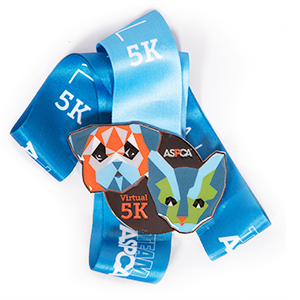 I currently just completed the ASPCA Virtual 5K by running 3.5 miles along the East Harlem River. The ASPCA adoption center in NYC found loving homes for 4,290 cats and dogs last year alone. Over 96,000 ASPCA Advocates took action to help pass important legislation for animals in this country. The amazing vets performed 85,151 spay/neuter surgeries in clinics from coast to coast. Voluneers tireless relocated 16,776 animals for a better chance of adoption. The ASPCA and the heroes that work for them rescued or assisted at least 11,504 animals from nautral disasters and cruel situations. This year alone we had volunteers help out in Texas after Hurrican Harvey and drove to Florida after Hurricane Irma. With people like you, who care about animals the ASPCA was able to raise 14.1 million dollars to more than 750 animal welfare organizaions across the U.S. and Puerto Rico. As an active volunteer I have worked alongside these amazing, heroic vets, trainers, volunteers, and animal lovers who have dedicated their lives to helping abused and homeless animals obtain a second chance at life. Please support me by making a donation and help me make a positive impact in the lives of animals! Thank you!